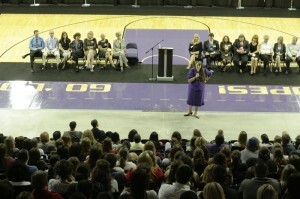 The quote by Henry Brooks Adams was the theme of keynote speaker Amanda McAdams at the College of Education’s student conference in GCU Arena on Wednesday morning. The conference, put on in partnership with the Arizona Educational Foundation, was opened with a prayer by Dean of Students Pastor Tim Griffin and an introduction by COE Assistant Dean Carlyn Ludlow, who told the students that teaching has to come from the heart. 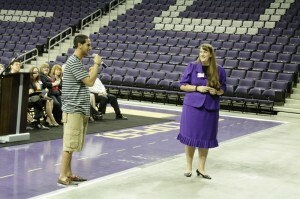 Amanda McAdams was the keynote speaker at COE’s student conference in the GCU Arena. McAdams, the 2011 Arizona Teacher of the Year winner, spoke to the COE students about the effects teachers can have on others. Asking the students to take a moment to think about a particular teacher who inspired them, senior Ramone Ramirez shared how in his sophomore year of high school, his science teacher rapped the periodic table, inspiring him to want to make learning fun. COE student Brian Morrison told of how his high school calculus teacher continued to come to class even after life dealt him two devastating blows, because seeing his students and teaching that class made him happy and got his day started out right. Morrison said he hoped to be able to make that kind of connection with his students someday. GCU senior Ramone Ramirez shared how in high school, his science teacher rapped the periodic table. McAdams shared her own story of going through life trying to decide what she wanted to do and the role models who inspired her. She spoke of how her goals of becoming an FBI agent changed to becoming a child-custody lawyer and then eventually a teacher who loves what she does. She also shared the story of Jesse, a student who was a challenge from the first day of school. She spoke about how she worked with Jesse and spent the time to get to know him, becoming one of the only friends he had and helping him pass her class. At the end of the year, the boy thanked her for believing in him. “Get involved when you teach,” she said in closing. “Be involved with your students outside of the classroom by coaching or being the sponsor of a club. It shows your kids that you are interested and care about them as a person.